What does this mean for blogging in general and the Palouse Wargaming Journal in particular? Since I did not use Google+ for blogging (well, at least I don't think I did), impact should be small. One ramification of the demise of Google+ is that any comments created with Google+ (your own blog or another's blog) will be deleted. Yikes! How many Followers have left comments on PWJ using Google+? I guess I will find out soon enough. The second fall out regards photo storage. If photos are stored on Google+, those are scheduled for deletion too. My. It is hard to determine exactly where my photos are stored. I hope all photos are stored on Blogger or Google. Hmm, very significant. Oh, I just saw that my comments are via Google. As you, Jonathan, I'm not sure how my photos are stored either. Guess we'll all find out in the coming months. Good to see that I will not lose all of your commentary, Dean, when Google unplugs the app! Yes, we will all find out what happens when the lights are turned off. Annoying, it is. Hopefully, we will experience minimal disruption. Can't say I used Google+ much, though I do worry sometimes that Google will kill Blogger one day, given the perception out there that blogging is a dying art form and has been supplanted by newer social media platforms. We hope not they kill Blogger ! Let us hope Blogger continues a long and healthy life cycle! Blogging as a dying art form? I hope not! Never quite understood Google+, so stayed away from it, luckily. I share others' sense of concern for the future of Blogger. A concern many of us share, for sure. We finally get used to newfangled technology and then it is taken away. Hardly sporting! It seems I am in good company. I don’t understand Google+ and ‘think’ I didn’t sign up when invited. I ‘think’ all my stuff will be okay, so just plan to go with the flow and see what joys April brings! I do not think I signed up when invited either. It is the possible knock-on effects that trouble me. I used Google +, but not the commenting app. So I should be ok......I hope? I hope so, too! I would hate to lose your commentary. I don't think it is too major as I use google photos for uploading. I never quite understood the advantage of proceeding through Google + as it seemed rather redundant to just following the blogs. I like your confidence! I use Google+ for some of the communities but nothing active outside of that interface to some interesting wargaming groups. That sounds like a tremendous amount of rework. Doable, yes, but that would be a big undertaking. Good! You seem prepared for the Google+ retirement. I don't think I actually used the plus for anything. I know my blog and most comments here are just straight google. I hope. Then you are in good shape! Thankfully Msr Foy warned me off it from the get go. That was good advice! I know several blogs converted over to Google+ but I never did. If something is not broken, why fix it? I didn't use for my own blog, but I did use it for comments on other blogs that used the format. I just didn't like it and glad I didn't adopt it. I am with you, Christopher. I did not care for the Google+ commenting mechanism either. Tony, I never was tempted to convert this blog to follow Google+ protocols either. As you say, it required a redefining of your environment. I did not want to be bothered with that either. Still, there were a number of interesting Google+ wargaming communities that I browsed. I have been having trouble commenting on Google+ blogs late last fall but that issue seems to have been worked out. There were so many complaints about this "feature" Google must have finally been pressured to address it. A recent iOS update messed with commenting on blogs too. Gladly that has been fixed as well. I know you have been very active on Google+. Good luck in the transition. I'm another who never really understood what it was about, which is no doubt part of the reason it failed. It just wasn't clear enough in terms of the benefits and what it was aimed at achieving. Like you, I never quite grasped the benefits either. I always found it difficult to comment on Google+ so generally I didn't,there are quite a few blogs I like which are on Google+ which is worrying. Some blogs I follow are on Google+ too. 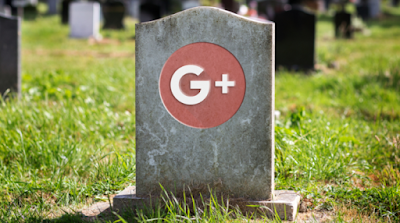 We will see what happens when the Google+ machine's plug is pulled. Many of us appear to be in the same camp. With some luck, we may weather this storm. You would think I would be prepared for this type of eventuality since my day job centres on document control and building protections against data abd systems redundancy...but I am not. At least I have most of the original images so I can recreate much of the content if needed. Let’s hope it does not come down to having to recreate all of your content. That would be a huge task. David, since you commented with Google+, I wonder if all of your comments will disappear when the Great Lever is thrown to shut it down? I got the same notification. Likely l don’t use it much. I don’t use it much either. Basically, if you want to post an image on your blog you get the choice of upload -from your computer, a url OR "this blog" and it states that all of the blog images are stored in Google Albums.For a lot of us bloggers it means we lose a lot of views each day and probably people in our "circle". Last time Google screwed up by making changes -the real reason they hit the skids because they changed Google plus so that you lost your views there -I had racked up over 2 million views -deleted without warning. What happens and how it affects bloggers we will need to wait and see. Thanks for the info, Terry! I got the same notification, and although I have a Google plus account, I used it for very little. Thus I suspect and hope it will have minimal impact. We will see! Facebook is not at all well suited to do what blogs do! I got the same message, and wondered about the same thing (comments, images, ...). I decided not to worry and see where we end up. I deleted my G+ account and files a few months ago, and have eliminated my account (I think :-)).